As we come in to the peak “weight gaining” season, I thought it would be timely to talk about the effects of being even just a few kilos overweight can have on your spine, posture and core strength. 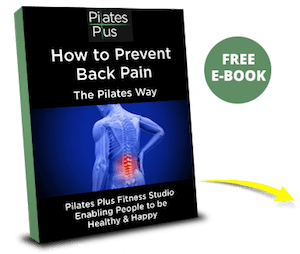 So below you’ll find a list of 5 reasons why losing weight will not only make you look and feel better, but create a body that is capable of performing day to day tasks with ease, and also capable of supporting and preserving joint health…including the spine. When you read through them, see how many reasons you can relate to. Then make a conscious decision to take action and make 2019 the year you do all you can to support and nurture your body…after all you only have one and it needs to last a lifetime! 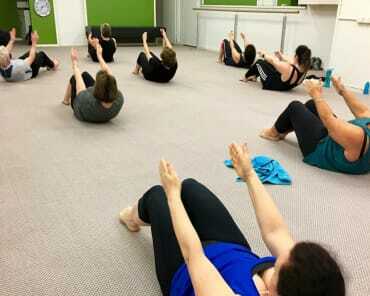 Firstly, CLICK HERE to read about how the abdominals work to provide strength and stability for your body. That way you’ll start to understand why having too much abdominal fat makes it challenging for them to work effectively. Put simply, when the abdominal muscles contract, they contract inward towards the organs. They create a strong “corset” or belt of the entire trunk and torso. Now body fat not only gets stored just under your skin (this is called subcutaneous fat), but also inside your body, around your organs (this is called visceral fat). When you have this visceral fat, and you try to contract your abdominal muscles inwards…well, you can’t do it. And that’s because there is no space for them to contract in to. It’s kind of like trying to squeeze a balloon and expecting it to stay squeezed in once you’ve let go. So will you be able to get strong abdominals if you are overweight? Maybe! But they won’t be capable of functioning to their best ability, leaving you vulnerable to potential lower back pain. And they love to bend in all sorts of different directions…backwards, sideways, twisting and forwards. If you have too much body fat around the middle, it really does restrict the amount of mobility you can achieve in your spine, especially bending forward. In our everyday life, we do a lot of forward bending in daily activities. Bending over to put your shoes on, picking kids from the floor, gardening, housework etc. The combination of a mobile, flexible spine AND strong abdominal muscles, creates a body capable of performing these activities easily, effortlessly and without injury. If you struggle with these activities and you are carrying a few extra kilos, then that extra weight is compromising your ability to get core strong and the long term health of your spine. 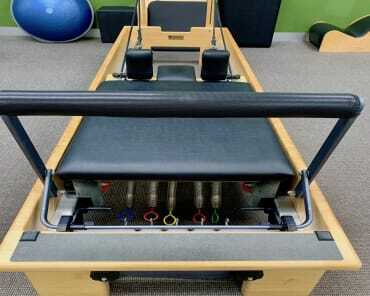 These days in the Pilates studio, there are certain issues in the body that we come across all the time. Back pain is a big one, but so is hip, knee and foot pain. More specifically, we are seeing more and more people who have degeneration of the hips and knees and the really common complaint of plantar fasciitis in the feet. So does being overweight contribute to these issues? Yes and no! There are certainly issues that happen with these joints that are unpreventable and do require medical intervention. But even if you do have one of these issues, being overweight certainly won’t help the issue. Here’s an analogy. If you are packing up your car to go on a long holiday and you’ve jammed it full with lots of heavy camping gear. The more gear you put in, the under carriage and tyres start to groan under the pressure and stop the shock absorbers of the car working effectively, so you feel every bump in the road. Now if you had an old car that you hadn’t looked after much or wasn’t built for that amount of load, it would buckle under the pressure more than a brand new well looked after model. That’s exactly like your hips, knees and feet. The more load they have on them, and the longer they have the load on them, the more likely they are to “buckle” or develop issues like degeneration and acute injury. There is no getting away from it, literally! We are immersed in gravity 24/7 and it has a huge impact on our body, but we are unaware of that impact…because it’s there all the time and we adapt accordingly. Now, strong and functional postural muscles, actively work against gravity, elongating and lengthening your spine up. 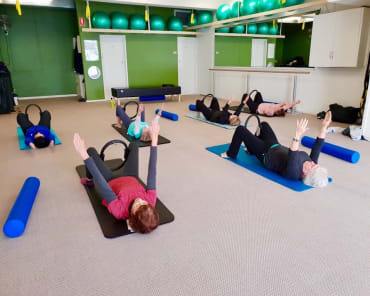 The Pilates method does this beautifully, and the longer you do Pilates, the more ingrained this action becomes, keeping your body aligned and upright. If you are overweight, the extra kilos drag your body down towards the ground, making it much harder to be upright. To understand this principle more, try carrying a 5-10kg weight in the front or back of your body and then try to stand as upright as you can. You may be able to do it, but I’m sure you won’t be able to sustain it for very long. So you can see that when you are 5-10kg overweight it adds an enormous work load to your postural muscles, challenging them to keep you in alignment and balance, preventing injury and degeneration of your spine. We are all born with a varying degrees of flexibility. I’m sure you know some people who can touch their toes and don’t need to do any flexibility work at all. But if you aren’t one of those people and you have issues with joint mobility and muscle tightness, being overweight isn’t going to help your cause. So why do we need to be flexible anyway? Because the body needs to be able to experience it’s full range of movement for joint health and to be able to perform everyday tasks easily. All the reasons we’ve spoken about so far contribute to an increase in a lack of flexibility, but the bottom line is that being overweight restricts your movement ability, leading to your joints becoming “rusty”. And rusty joints can become prone to degeneration and injury.